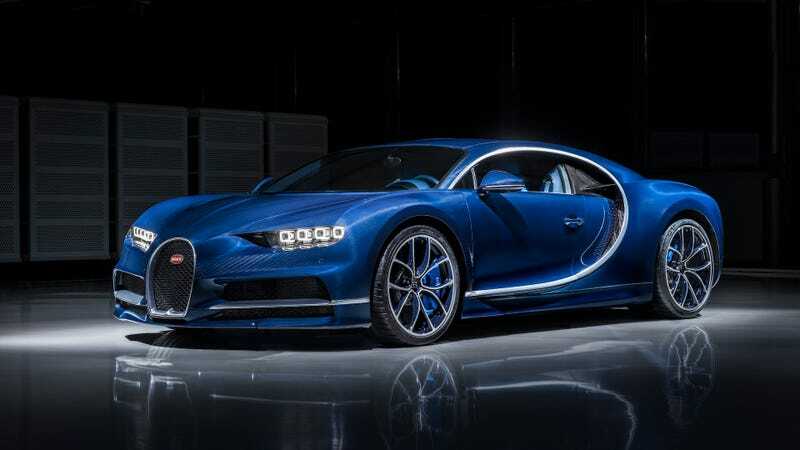 The world’s most powerful production car, the nearly $3 million Bugatti Chiron, has been out for almost a year and a half now. But we still don’t know its top speed, and we won’t for a while—a Bugatti test driver said the closer the car gets to 300 mph, the less likely it is that modern tires can handle the pressure. We’ve never known the Chiron’s top speed other than rumors about it, thanks to a limiter that caps it off at 261 mph. The manufacturer might not even know that number, since it doesn’t plan to make an true, unrestricted speed run until 2018. The Veyron, its predecessor, ran 267.8 mph without a limiter in 2013. At the moment, Bugatti test driver and Le Mans champ Andy Wallace doesn’t seem to have much hope for the car blowing that number out of the water once the limiter is off. Wallace implied the Chiron reaches its limited speed of 261 mph with relative ease. So, could there be another 39-mph left? He says that speed is unlikely because the forces at that level are devastating. Jalopnik has reached out to Bugatti for comment on how tires may affect the Chiron’s top speed. But that’s an odd development to read, considering the Chiron was running on the testing grounds for pretty much every car, the Nürburgring, just recently. It wasn’t clear what the car was doing there since it’s been out for a while, but we just rolled with it and enjoyed the show. Of course, the Chiron isn’t going to get to 300 mph on the ‘Ring. But other than a performance variant (lol) we haven’t heard about yet or some other component on the car, what could Bugatti be testing out there? Flight capabilities? Probably not. That seems like a punch in the throat after shoveling out $3 million, but it’d be a headache just finding a strip of land to use the limited 261 mph on anyway—let alone the unlimited speed. Thus, the top speed does nothing more than give Bugatti and its millionaire customers something to brag about on Instagram. If anything, the Nürburgring should expand its capabilities to testing people’s patience. It must be a real drag—both literally and figuratively—to spend so much money on a car and not be able to go any faster than 261 mph.